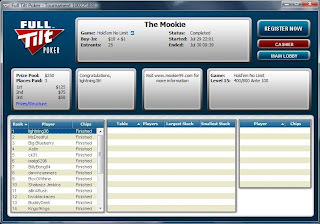 Believe it or not, I notched my second Mookie victory in a month by winning the July 29 tournament. The last victory came on July 1. Another relatively small field (25) helped. Hitting many flops in the first hour helped. Catching no cards in the second hour sucked, but hitting the flops in the last half hour did the trick. Funny thing -- no A-A, no K-K, no Q-Q the entire tournament. But hey -- after waiting such a long time for the previous Mookie win, I will gladly accept this second one in July. Time for a short vacation this weekend as I travel with my wife to Memphis for a little fun and relaxation. The trip will get off to a fun start by stopping for lunch at Lambert's Cafe , home of the "throwed rolls." The trip will include visits to the National Civil Rights Museum, Beale Street, Interstate Bar-B-Que (trying out this place for the first time), and a lunch at Corky's Ribs & BBQ, courtesy of fellow blogger Memphis MOJO, who plans on making good on our last-longer bet at the WSOP Seniors Event last month. I have been to Graceland several times and do not plan to stop there, but almost feel like I should since Elvis's TCB (Taking Care of Business) insignia with the lightning bolt was 1/2 the inspiration for my online poker name, lightning36. Now you know! I was pretty accurate in predicting the success of the Chicago Blackhawks in the 2009 Stanley Cup playoffs. 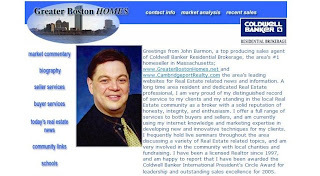 It wasn't that I knew more than others or had any special insights. It was just a feeling -- something only a lifelong fan could have. Well, the other night a very strong feeling came over me. My prediction: the Chicago Cubs will be going to the 2009 World Series. I could certainly come up with logical reasons, like the Cubs' pitching and everyday line-up. But I won't. I just have that feeling. Again. And I believe. ** Life has finally begun to return to normal in the lightning36 household. On the day I left for Las Vegas about six weeks ago, an unlicensed driver turned left right in front of my wife, causing $5000 worth of damage to our van. And of course, the owner of the car was insured by a high-risk insurer -- one of those places that tries to avoid paying at all costs. They will now be fighting with my insurance company over how much each agency owes. What a joke. The scammer insurance company "determined" that my wife was 45% responsible. At least we have our van back. 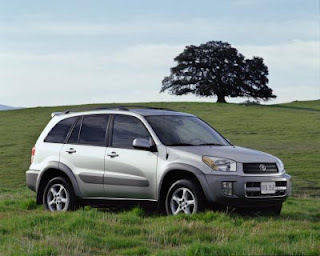 ** We picked up a nice used car for the kids this past week -- a 2001 Toyota RAV4 (pictured above). The car belonged to a visiting university scholar who was leaving the country. It will replace my dad's old 1992 Honda Accord, which my dad gave me shortly before he passed away. In the spirit of paying it forward, I gave the Accord to my sister-in-law, who could really use it. And yes -- it felt good! Now, as long as I can cope without having some type of Honda -- breaking a streak of 21 years of Honda ownership -- I will be okay. ** My wife and I will be traveling to Memphis this coming weekend. The trip had been planned for some time, but our summer schedule got all screwed up with my wife's accident, her job loss, and my son's drivers ed class. We hope to meet up with Memphis MOJO on Sunday. ** I have been playing a little online poker the past few weeks, but am really in a summer lull. I did take down the blogger Skillz tournament last week (7 Card Stud), but other than that, nothing of note. I decided against playing in some midwest tournaments, so I am itching for some live poker action. Yes -- I was a Chicago White Sox fan in 1979 (and still am). I was working a summer job as a security guard at Illinois Benedictine College (now Benedictine University), usually 11pm until 7am the next morning. This was, of course, after working a 5pm-10pm evening factory shift at Tellabs, a telecommunications equipment provider. Fun summer between my junior and senior years in college. The night security gig at IBC was usually boring -- unless, of course, there was a volleyball camp on campus, which meant lots of flirting with young, athletic girls. To pass the time, we used to listen to the radio -- Steve Dahl on WLUP, "The Loop." I am proud to say that I was a card-carrying member of Dahl's Insane Coho Lips Anti-Disco Army. One of Dahl's favorite games was to announce that he and his army were going to "take over" a disco. He would announce which disco and which night, and anywhere from one to five thousand people would show up. 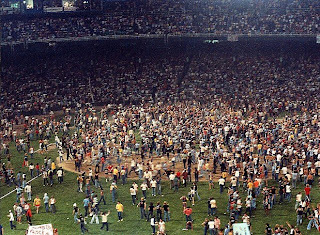 Thus was born Disco Demolition Night -- 30 years ago at old Comiskey Park. Entry fee: 98 cents and a disco record, which would be blown up between games of the White Sox - Detroit double header. With thousands of fans over capacity (many had snuck in) and drunk or high, the disaster was just waiting to happen. After Dahl had a demolition expert blow up all the disco records, fans stormed the field, which was littered with record shards, and even started fires in several parts of the field and the stands. The field was destroyed and the fans would not leave, prompting the forfeiture of game two. This was the last American League game that was decided by forfeit. As for me ... as much as I wanted to go, going to baseball games just did not jibe with a 65-80 hour work week. I like to think that I have few regrets in my life, but damn -- I wish I had gone and become part of baseball history. This guy was best known for winning a bet for some guys ... by eating his boogers! Yes -- it's him! July4 Full Tilt $28,000 Guarantee. I was playing a good, steady game. A shorter stack raised pre-flop and I had K-K. I went all in and was called by a stack a little bit bigger than mine. I was horrified to see what we all had. Virtually no outs. Out in 233rd. What a game we play, huh? We need to keep bloggers in Las Vegas more often. At least then I am able to cash in the weekly blogger tournaments. I got second in the Skillz game last night and won against a small but talented Mookie field tonight. It was good to get the Mookie monkey off my back. I won the second one I played in, and then went winless until tonight. 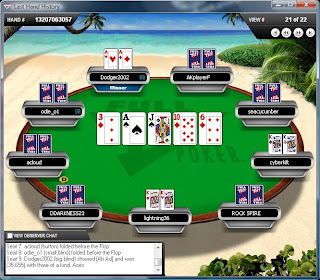 I got a few second places and made some final tables, but just could not seal the deal. Streak broken. Every time I head to Las Vegas, something bad happens at home. This year I didn't even make it all the way to Las Vegas before the disaster happened. I called home during my brief layover in Denver and found that my wife had been in an accident in our van. An unlicensed driver turned right in front of her. The damage is somewhere between $3,000 and $6,000. And of course, the guy who owned the car my wife hit (brother of the driver) has his auto insurance through a high-risk insurance agency, so of course they have been doing everything to delay paying and making things right. We hope to get our van back in just over a week. Stop by Mondogarage's blog and offer a few words of encouragement. Mondo's wife has a serious medical problem and is doing her best to fight through it. Although I only know Mondo through his blog and the blogger tournaments, I do know that this has to have taken a toll on him. Mondo is a good guy (despite his over-the-top Obama support - he he) and could certainly use our support, prayers, karma, and whatever. The Chicago Blackhawks added Marian Hossa and lost Martin Havlat and Nikolai Khabibulin. No way they were going to keep the Bulin Wall since they are paying so much money to Christobal Huet. Although Havlat was a fan favorite, he lost many games to injury. Getting Hossa instead of Havlat will improve the Hawks. Now that my World Series of Poker is over, I might look to play in a couple of tournaments in Indiana. The Heartland Poker Tour is at the Majestic Star Casinos in Gary this month, and the 4th Annual Denny Crum Poker Open is at the Horseshoe Casino Southern Indiana. Both casinos are within a reasonable distance of my house. The bar for blogger poker performance has been set high in Las Vegas this summer. Time for me to do my part.